The Master of Frankfurt was a painter active in Antwerp in the late 15th and early 16th century. His name derives from two important commissions that he executed: The Holy Kinship and The Crucifixion. The first is now in the Historisches Museum and the second in the Städelsches Kunstinstitut, both in Frankfurt. Max Friedländer attributed the present painting to the Netherlandish school due to the evident influence of Flemish artists such as Rogier van der Weyden and Robert Campin. In the foreground the panel depicts the Virgin with the Infant Christ seated on her lap. Behind them on the left we see Saint Joseph offering the Christ Child an apple in an allusion to Original Sin and to Christ’s role as Redeemer. The Virgin and Child both hold carnations, while the Child also has a basket of roses in reference to his Passion. This anonymous painter located his composition in an open setting with a succession of relatively well-constructed spatial planes. 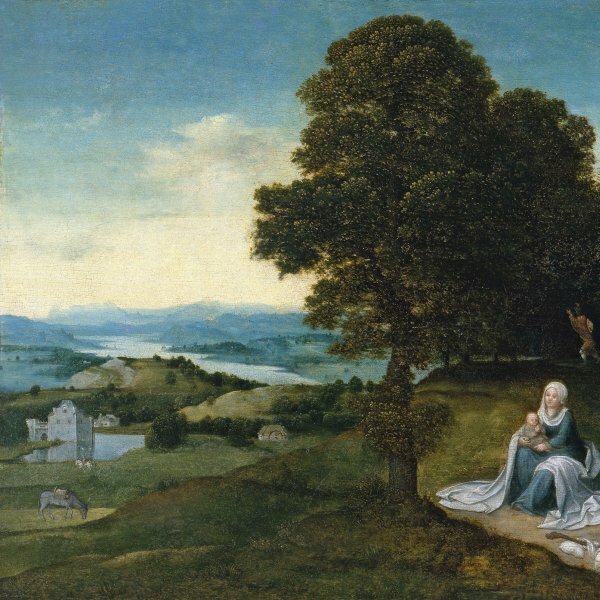 Colin Eisler considered this painting to be inspired by Martin Schongauer’s engraving of The Virgin and Child on a grassy Bank. The Master of Frankfurt derives his name from the city in which his most important works are to be found. They comprise two altarpieces, one of The Holy Kinship of around 1505 painted for the Dominican church and now in the Historisches Museum, and the other a triptych of The Crucifixion commissioned by Claus Humbracht, a member of one of the city’s most influential families (now in the Städelsches Kunstinstitut, Frankfurt). Attempts have been made to identify this anonymous artist with the painter Hendrik van Wueluwe, who was from the Woluwe region and is documented in Antwerp between 1483 and his death in 1533. Van Wueluwe occupied the position of dean of the painters’ guild in Antwerp on various occasions. 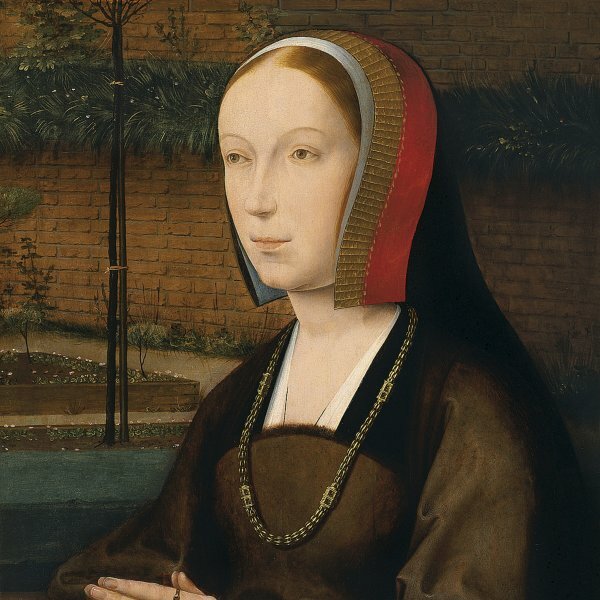 The Master of Frankfurt, who had a very active workshop, is considered to have painted two celebrated works now in the Musée royal des Beaux-Arts Antwerp: Festival of the Archers of around 1493 and Portrait of the Artist and his Wife of 1496. In addition to the year of its execution, the latter painting also includes the ages of the figures, which has allowed the artist’s date of birth to be placed around 1460. In addition, it is one of the first double portraits to be painted in the Low Countries. 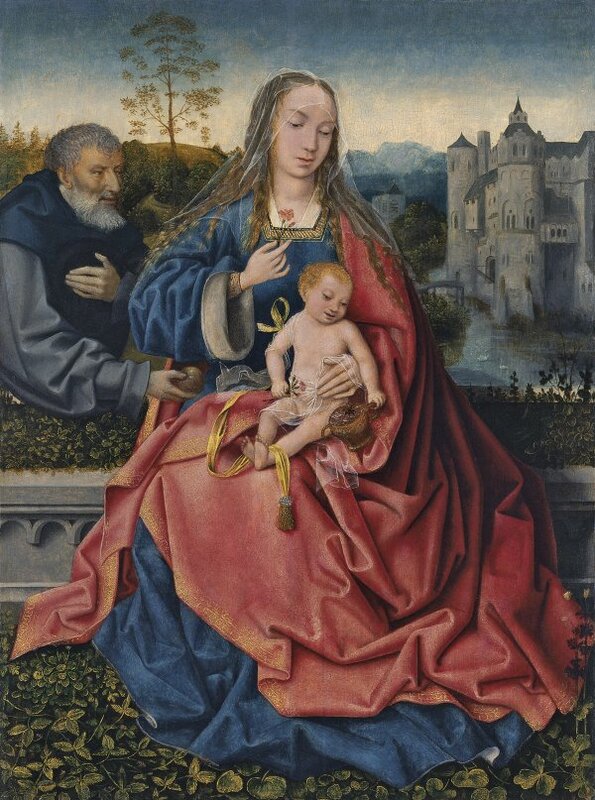 The Master of Frankfurt’s style looked to traditional models developed by earlier generations of Flemish painters such as Rogier van der Weyden and Hugo van der Goes, while details from the Lower Rhine School are also evident to a lesser degree. 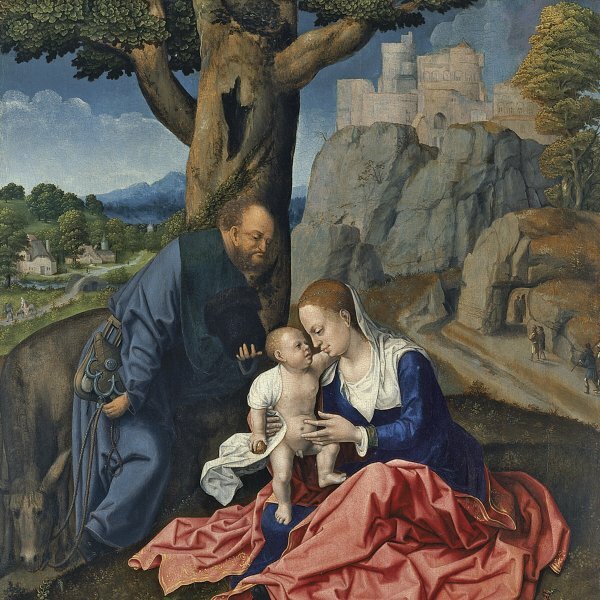 The Holy Family was in the Piérard collection in Valenciennes where it was catalogued as a work of the School of Van Eyck. In 1928 it was documented in the Hoogendijk collection, entering the Rohonz collection that same year, and in whose catalogues it appears from 1930. The painting was first published by Friedländer who attributed it to the Master of Frankfurt, an attribution that has been retained to the present day. The composition depicts a tranquil episode from the childhood of Christ and incorporates various symbolic elements. Mary, with the Infant Christ on her knees, fills the centre of the composition with her frontal pose and majestic volume. Saint Joseph on one side, who is awkwardly inserted into the composition, offers Christ an apple in an overt reference to Original Sin and to Christ’s role as Redeemer. Despite the message that it conveys, the image is very much of its time with a new emphasis on the secular in the setting, the poses and the objects held by the figures. Mary holds some pinks in her hand, as does the Christ Child who also plays with a basket of roses whose red flowers refer to his future Passion. The artist does not fully dominate the recession of the planes into the pictorial depth, introducing the viewer into the composition through the thick carpet of leaves and flowers in the foreground that functions to emphasis the figures’ frontal presentation. Despite these inaccuracies, however, the Master of Frankfurt created a refined and elegant work. Among precedents for the composition Colin Eisler suggested the influence of Martin Schongauer’s print The Virgin and Child on a grassy Bench. Due to the presence of pentimenti in the underdrawing, Eisler considered that the present panel is an autograph work by the Master of Frankfurt. He rejected Goddard’s idea that it involves a high degree of workshop participation.